One of the reasons that I really like working with Steve and with the Finest Call range is because the range of products really does cover pretty much every basis. Some bartenders had said, "Well, we make our own purees in house." Well, what do you think we do? We've just got a really big pop. I went over to Kentucky. I've seen their production process. The amount of care and attention that actually goes into these products is amazing. I think the great testimony to it is that a lot of the top-end cocktail bars are using these products and it's because of the quality of those ingredients there. One of the reasons I chose this at the beginning, is because, for me, this is one of those products where the quality just shines through. Now, if I wanted to make my own puree and my own bar, there's no way one Earth I could get it to taste like this. 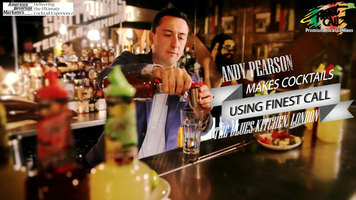 Finest Call uses high-quality ingredients in their recipes to produce great-tasting cocktail mixes! They're easy to use and provide you with a fast way to make a wide variety of drinks. Start a whirlwind of applause at your bar, party, or special event with this Finest Call Premium Hurricane drink mix! 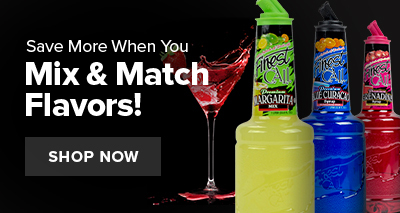 With its perfect blend of passion fruit puree, lime juice, and dark cherries, Finest Call Premium Hurricane drink mixer adds a sweet splash of fruit flavor and a dash of dazzling red color to popular drinks like Hurricanes, martinis, or your signature house punch. The color and bold taste of this drink mix creates new specialty drinks that stand apart from your other menu options, whether served frozen or on the rocks! 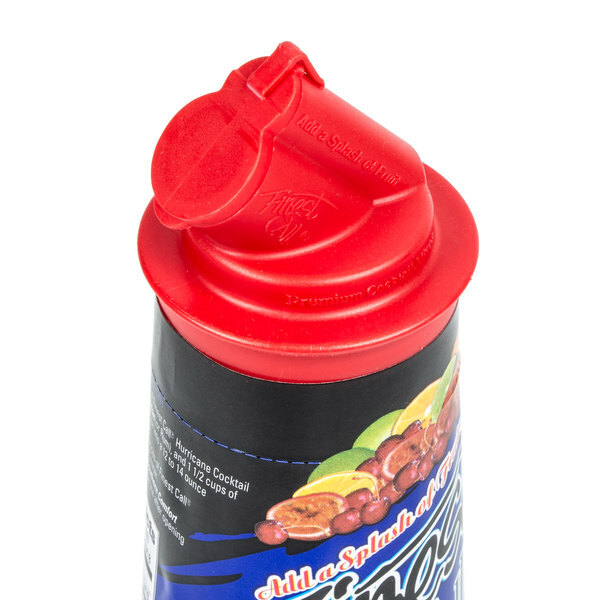 Each bottle features Finest Call's patented pourer and closure cap that reduces drips to keep your bar free of spills and messes. The long bottle neck and pourer top help provide a perfect pour every time, while the closure cap solves the problem of storing any unused portions. Easy for your bartenders and mixologists to use, the liter bottle also has an attractive shelf presence for any bar service! For a classic hurricane on the rocks, mix together 4 oz of hurricane cocktail mix, 4 oz of water, and 1 1/2 oz of rum before garnishing and serving over ice. I love all the flavors in a good hurricane cocktail. Passion fruit, lime and cherry. The tastes are so spot on. Really easy to make and mix. 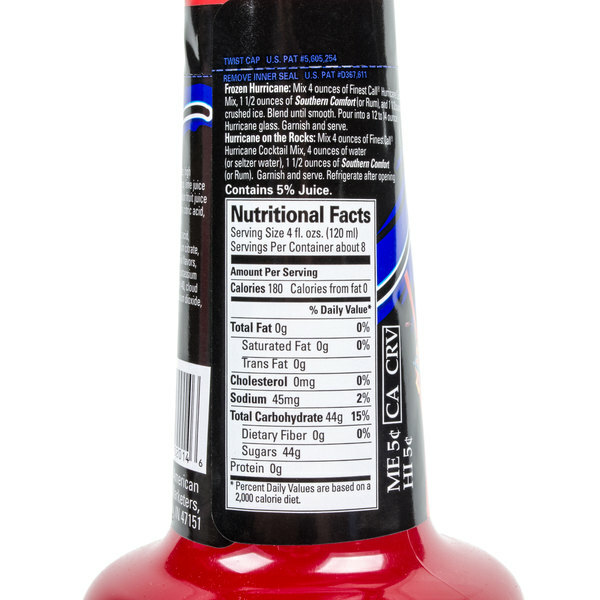 This is a very delicious fruit juice blend with distinct flavors. It goes very well in mixed drinks of all sorts as well as non-alcoholic drinks. Difficult product to find locally, glad to find it here! Mixes well in my slush machine. Wish it was available in larger containers, but will continue purchasing this way! The hurricane drink mix is great and very fruity. The best mix for our bar because it is so easy to prepare and the taste is top notch. You will not find an easier way to make a Hurricane without this drink mixer! This cocktail mixer is so easy to use and helps an amatuer home bartender feel like a professional! High quality product and reasonably priced way beyond local retail stores! I now know how to make a Hurricane without stressing about the taste or quality! Very well packaged and quick shipping, priced right. Great flavor, mixes good with rum or vodka. Will be ordering by the case next time, should be a huge hit this summer. We used these for a Mardi Gras themed party. Our guests really enjoyed them and the mix tastes great. We will be using this again next year. The Finest Call Premiu, Hurricane Drink Mixer is perfect. It tastes delicious and its an absolute hit at all of our catering events! I highly recommend! We really do enjoy usine this finest call premium hurricane drink mixer. It makes great cocktails and we go through it so quickly. It has a great flavor too! Top quality hurricane drink mixer that is great for making our loaded punch. Great fruit flavor and really great price per bottle. A great item from Finest Call. 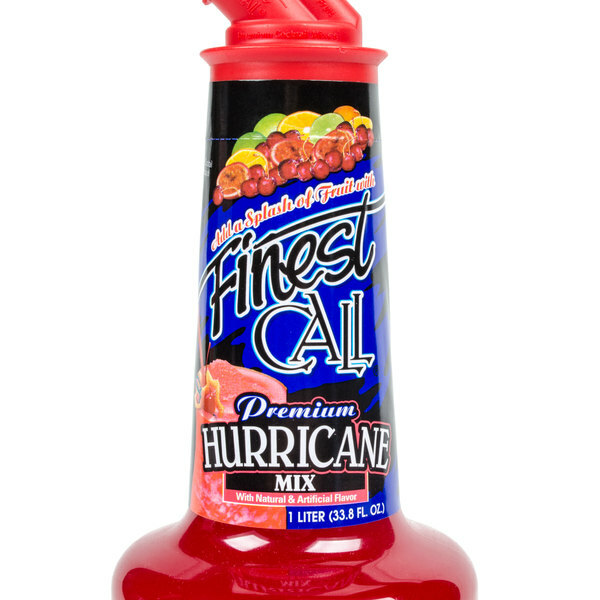 The Finest call premium hurricane drink mixer is a great item and perfect for making our hurricane punch. Great fruit punch flavor and a wonderful mixer. The Hurricane drink mix is very fruity and almost has a fruit punch taste. A great pool side drink mix that is really good mixed with rum. A nice addition to our pool parties. 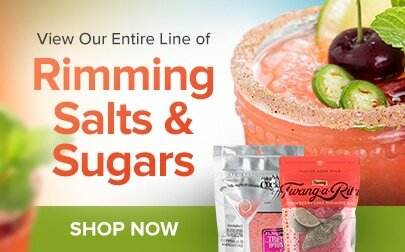 Looking for a way to make great tasting drinks? Look no further than the Finest Call brand. Simply follow the instructions on the bottle for the perfect Hurricane. The perfect drink mix that everyone is sure to love. 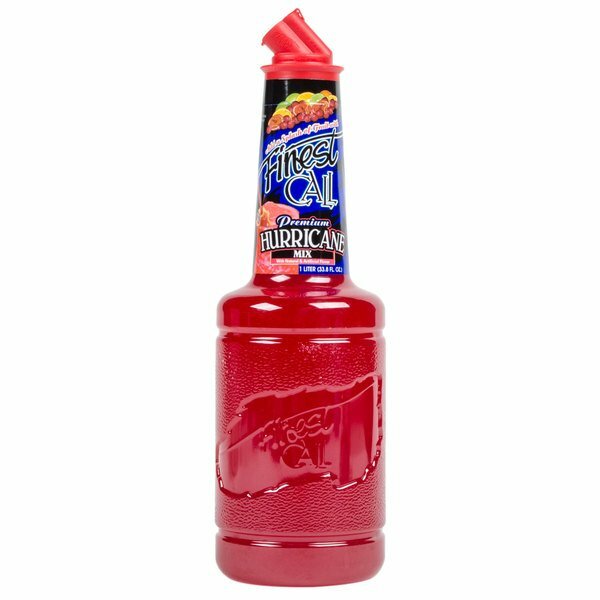 The Hurricane has a fruit punch flavor and can be mixed with a variety of alcohol varieties. Finest call hurricane drink mix taste just like fruit punch. It makes great cocktails and is wonderful for making party punches for game day football tailgates. The name speaks for itself. This Finest Call mixer will have everyone asking you what the ingredients were to the best hurricane that they have ever tasted. The Hurricane mix was very fruity and flavorful and will most certainly make you feel like you are having a drink on Bourbon Street. I have started ending everyday with a hurricane after drinking this stuff. It tastes amazing and is super simple to use. The recipe on the bottle is pretty good although I tend to add an extra half ounce of syrup because I love it sweet! wonderful drink mix, it tastes fresh, has 20 percent juice, and was a hit at my party, would buy any other mix from finest call. I absolutely love this product! This finest call premium hurricane drink mixer 1 liter tastes absolutely amazing! This hurricane drink is a great addition to our mix collection. I love this product. The flavor and quality is above average. I highly recommend this product and I will continue to order as needed for my bar. This is a fantastic quick mix, easy to use and makes a tasty drink. I would recommend this to anyone looking for a fast and convenient mix. We used this in a signature drink for a Superhero themed party! Mixed with the right ingredients it gave a great color. It was a little bit sweeter than I would have liked, but for what we needed it worked really well. We have made Hurricanes from scratch and with the mix it speeds things up greatly. Customers have really complimented us on the flavor and keep reordering. This a very flavorful mix almost reminding me of a fruit punch. I add rum or vodka depending on the customers choice and like to serve blended. Makes a great summertime drink. This mix has a liquid hard candy flavor with a very long, thick finish. Many hurricane attempts were no successful. I'd advise sticking to a traditional recipe. We appreciate your review, Joseph! If you are looking for more information on the product that you are purchasing, please contact our Customer Solutions team. We bought this simply to avoid spending time mixing drinks from scratch over the holidays. The taste is good, and the value is fantastic. We'll probably try the suggestion to add it to punch also. I ordered the Hurricane Drink Mixer to mix with rum for our summer employee party. It has a very good taste and was a hit! We get lazy when it is busy and use hurricane mix instead of trying to mix all the juices and cordials together. Great product for busy bar. Making Frozen Hurricanes from scratch is a little complicated because it involves at least for 4 different fruit juices and other ingredients. Well, complicate no more. With this mix, all you need is rum, ice and the mix and you're good to go. Amazing taste! Fruity and sweet, this drink mix is good stuff to have on hand for mixing up "tropical" drinks when you don't have the time or resources to create from scratch. It has more of a cherry flavor that the passion fruit taste of a traditional Hurricane, but it still is tasty and flavor-packed. My all time favorite drink is a Hurricane and its not so easy to make a perfect hurricane from home, plus finding a drink mix is pretty difficult. so the fact that its already made up and the price is so convenient as well, its a must have at any bar. The Finest Call Premium Hurricane Drink 1 Liter .Has the great flavor of sweet fruits .Just add rum and there you go.The easy pour spout realy makes it easy to pour.